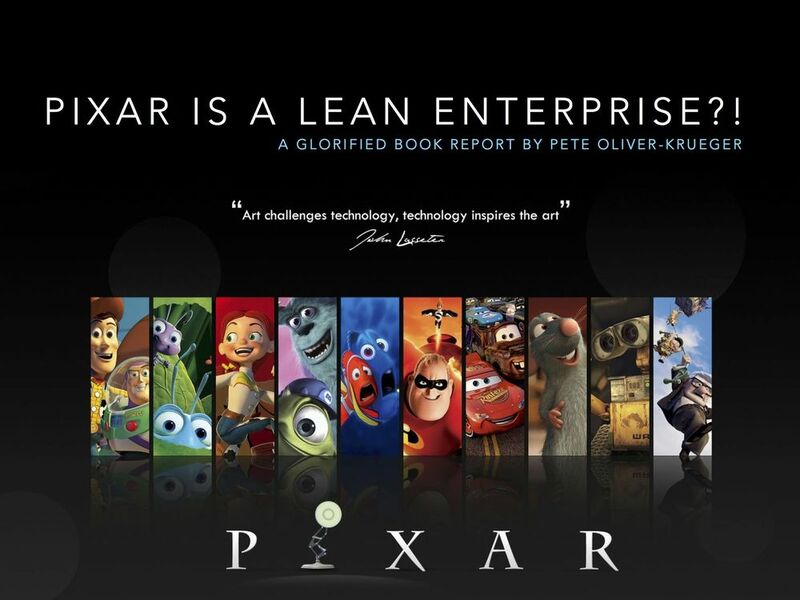 In reading Ed Catmull's book I was struck by several "clues", some more clear than others, that Pixar employs Lean Enterprise techniques. 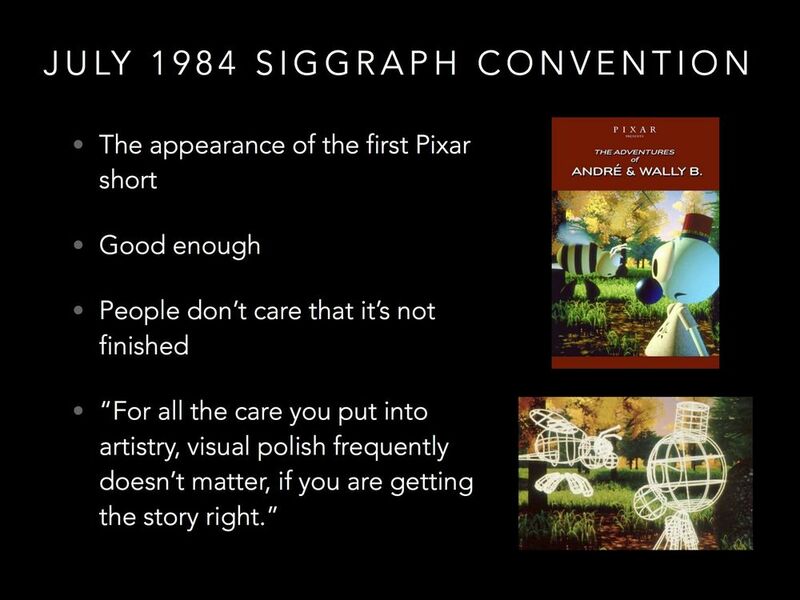 Pixar was so far behind production for their first public demo that some of the scenes had to be shown in wireframe version. Surprisingly, most people were so caught up in the story that they never noticed! Don't wait. Test what you have! Change is the only constant. 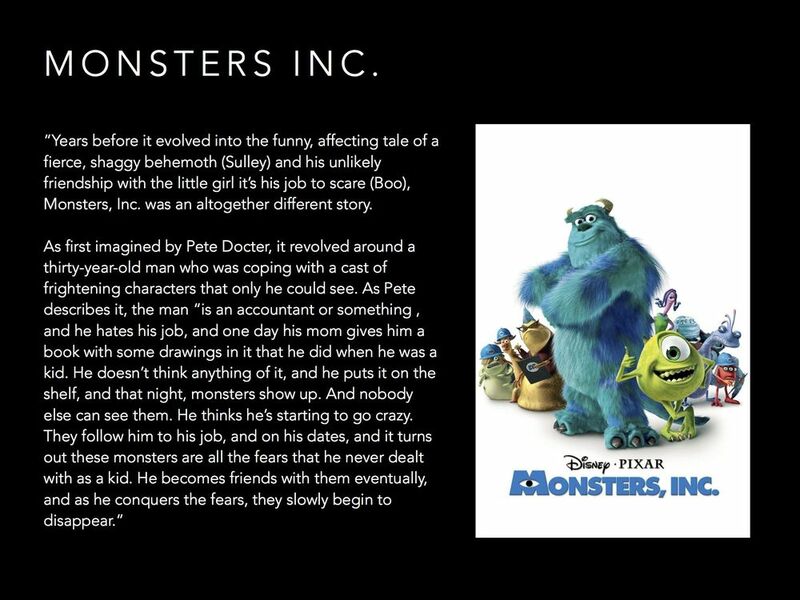 This was the original story of "Monsters Inc.", nowhere near where the story ended up. Have a vision, but be willing to change that vision when you find something better. Steve Jobs was an expert at testing the market, without the market knowing they were in a test. 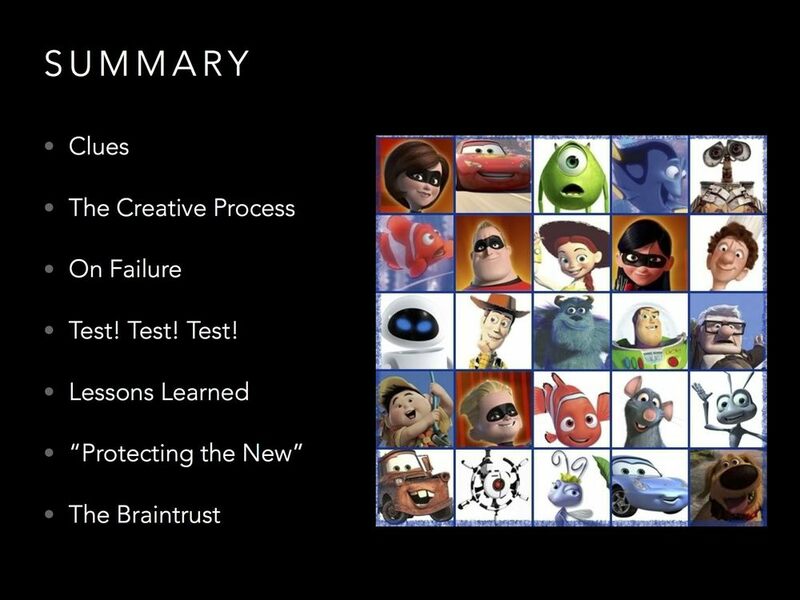 He tried to "sell" Pixar multiple times in order to determine it's value in the market. 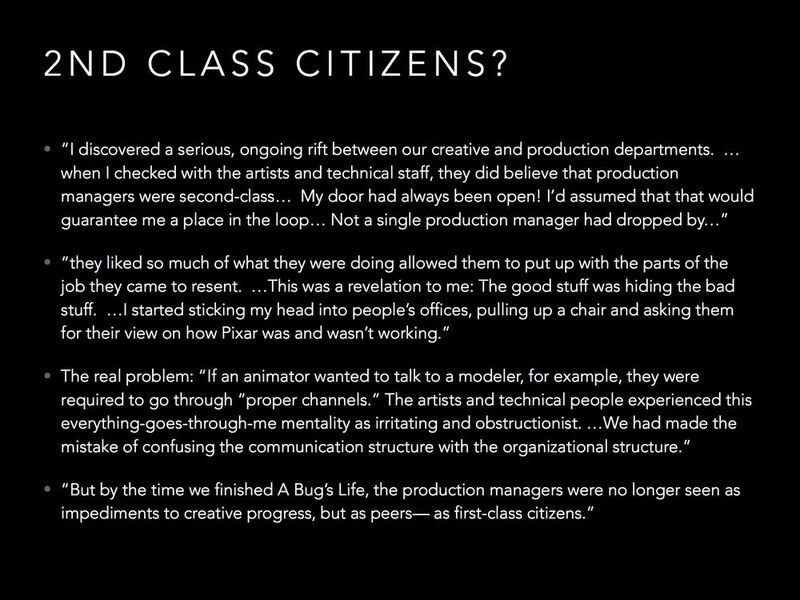 As an example of how you have to get out and search for the answers, Ed tells the story of the battle between Production Managers and the Creative staff. It turns out an upper management decision to tie communication to the organization hierarchy was the real culprit. 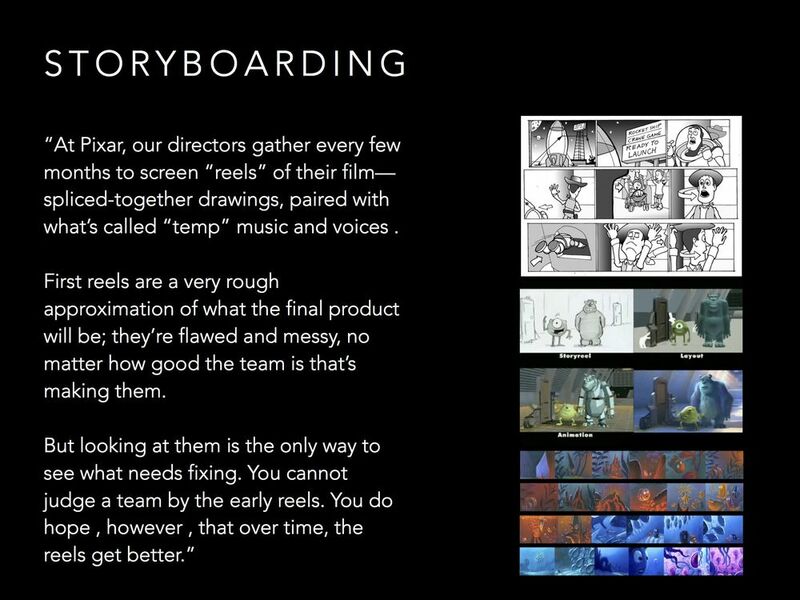 Movies constantly use MVPs, in the form of storyboards. Early on they're sketched, then using rough computer models, then colorized, etc. At each stage you do the least amount of work to have a good discussion about it. 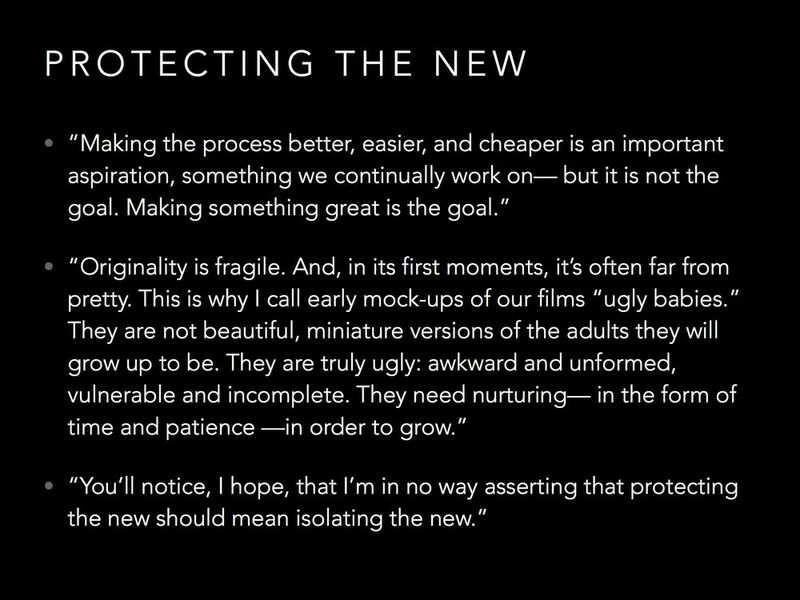 One of Pixar's core values is "Protecting the New", because great ideas don't look great in the beginning. 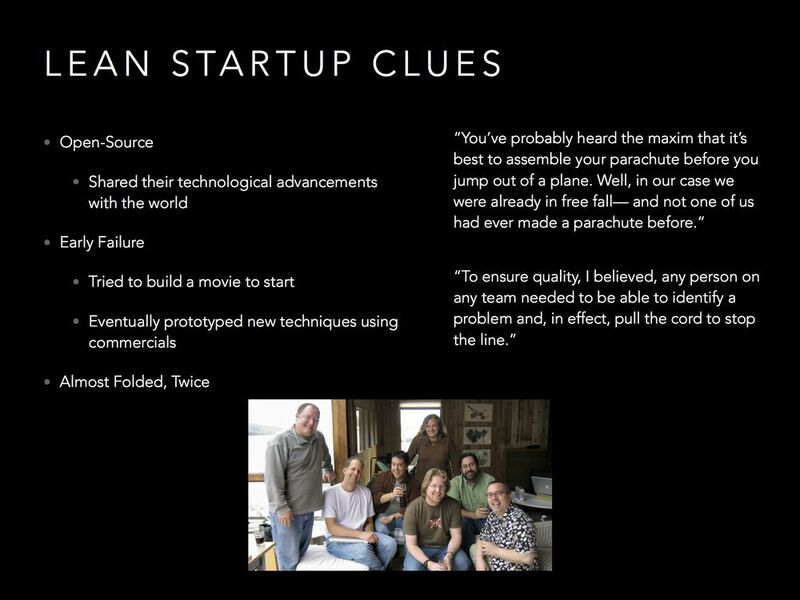 Many enterprises play with the idea of starting an incubator. 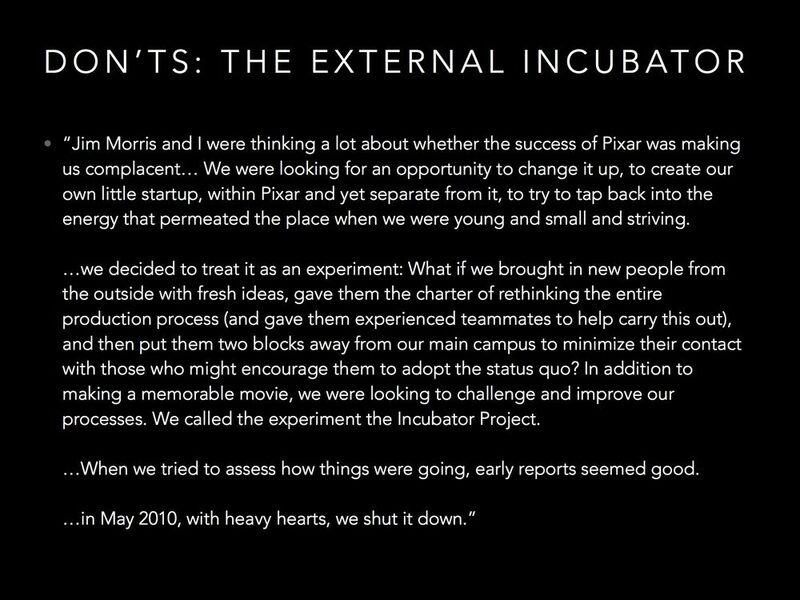 Pixar, like others, found that creating an incubator isolated the incubated from the wisdom and experience of the organization, and isolated the organization from the fresh ideas of the incubated. So they shut it down. 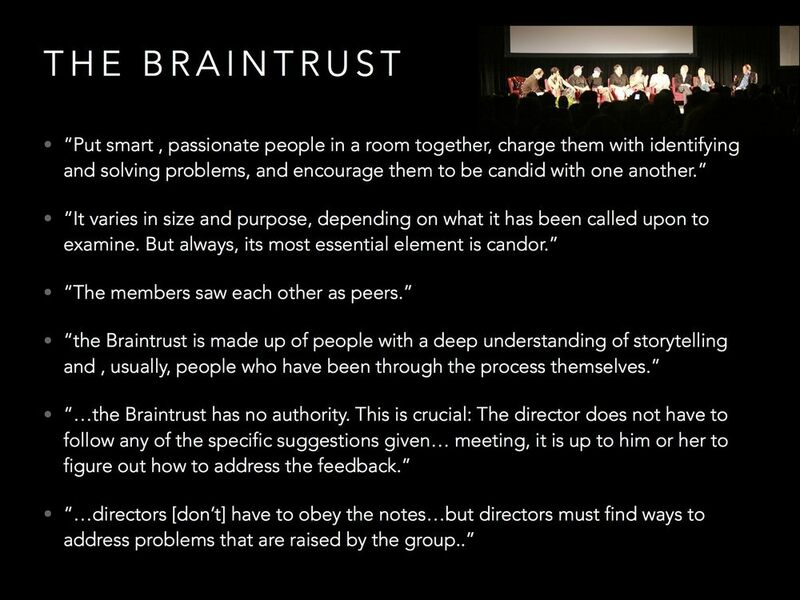 Another core to Pixar is the use of the Braintrust. It's a meeting with Pixar mentors where young directors can present their works-in-progress for feedback. The structure of the Braintrust is very unique, though, and designed to "Protect the New". 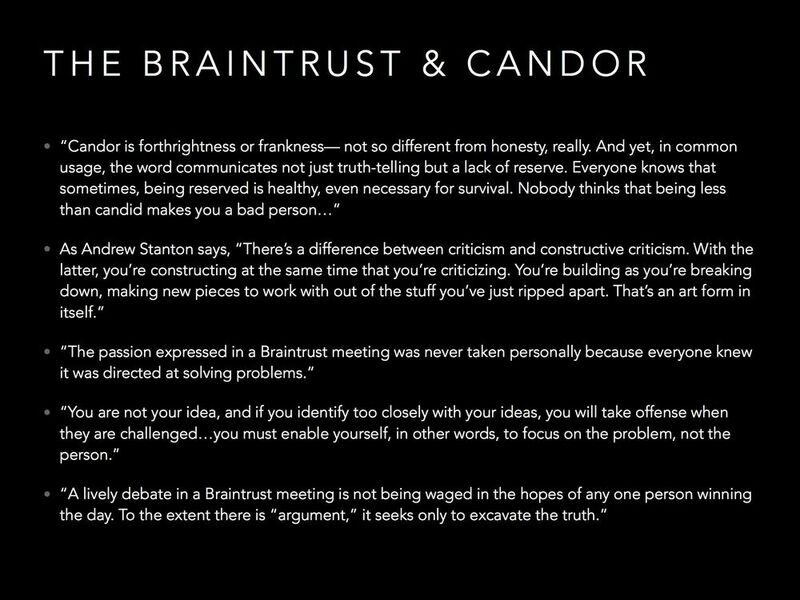 At the heart of the Braintrust is "Candor". Candor is like truth, but different. At Lean Startup Academy we ran our own braintrust. 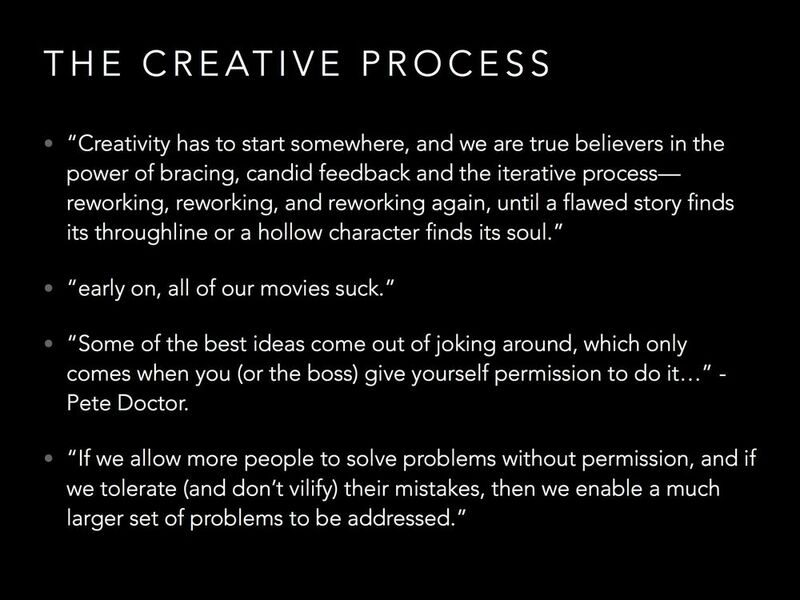 Since we didn't know the exact format of Pixar, we used the Praise, Question, Polish approach to giving feedback. It's a great, supportive process that has gotten great feedback.